Best news you've heard all year or what? CLEVELAND - Cleveland Clinic researchers said they've made a discovery that may lead to a cure for breast cancer. In a study just released Sunday, those researchers said they've come up with a vaccine that may not only treat, but also 'prevent' one of the biggest threats known to women. Ahmed Marcouch - World Champ Diversity & Integration! Ever heard of a Muslim politician who is a strong advocate for freedom of religion, secularism, women's rights, gay rights, the right to be an apostate, and speaks out against violence, extremism, antisemitism, holocaust denial, radical Islam and "Islamization" everywhere? Welcome Islam; combat violence and extremism; allow space for orthodox Muslims; support the emancipation process of gays and lesbians; always stimulate discussion and debate; combat discrimination. I first heard of Ahmed Marcouch a few years ago, when he was making the headlines as Holland's first ever District Mayor of Moroccan/Muslim descent and then again recently when he was promoted to his new position as City Councilman. Chances are we'll be hearing a great deal more about him, as he is about to embark on yet another journey in his young political career. As one of the top candidates for Dutch Labor Party (PvdA), he'll be running for national election next month. I feel greatly honored that the 4/5 May Committee Slotervaart has given me the opportunity to hold this Memorial Day speech. I do realize what this means. As a police officer, I have safeguarded Memorial Day for many years. As a District Mayor, I used to place the wreath. And now I have been given the privilege to hold this speech. then the light goes off... "
Officially, on May 4th, we remember all the victims since World War II, the victims of wars all over the world. Nevertheless, today, I want to focus on the Dutch Jews, gypsies, gays, and disabled who have been killed, as well as our slain people of the resistance and our fallen soldiers. The Shoah is by far the biggest tragedy in our Dutch history. It has traumatized us till this day. The genocide committed on Jews has determined how we apply ourselves in defense of universal human rights, our need for freedom, and our stance towards well-meant multicultural ideals. We are still preoccupied by it. I agree with Rabbi Evers that Germany is coping well with its past atrocities, and that the German government will always be welcome, except on Memorial Day, May 4th. We should also remember and honor victims of present day wars every day, like the wars in Afghanistan, Iraq, Sudan, Israel, and Palestine. However, on May 4th, we remember the victims and the martyrs of World War II, especially the victims of the Shoah. Many survivors are still alive today, and as long as the lives of their children and grandchildren are still affected by it. How big of an impact on the lives of those who were born after the war, was reflected this past weekend by Ernst Hirsch Ballin, whose German-Jewish grandmother was killed. The Minister said: "my father has been sad all his life. I cherish the rare moments when he is cheerful". Prior to the persecution of the Jews, systematic dehumanization and discrimination of this entire segment of the population took place and lasted at least ten years. That is why we are vigilant with regards to discrimination and especially antisemitism. That is an advantage. In this sense, we remember the sacrifices people made in order for us to have the freedom we have today, and we have to do everything possible to combat antisemitism. Religious Jews like Rabbi Sebbag and Gideon van der Sluis travel by foot Sabbath, so on Saturdays, they walk from the "Rivierenbuurt" to the synagogue in "De Pijp". They tell us that people call them names like "Yahoud", and throw coins at them. Moroccan youngsters confirm that they have friends who do this. It is absolutely unacceptable if Jews in Amsterdam cannot wear a yarmulke. We cannot play this down in any way shape or form, and we have to make a firm commitment to making sure that Jews can be themselves, under all circumstances. Dehumanizing and alienating entire non-native segments of the population, however, doesn't work. That is unjust and barbarian. That is what we have learned from World War II. From the dead, we have learned something even better. We have to distinguish the good from the bad, throughout our communities. We have to publicly express our solidarity with those who are good. Of course we report any form of antisemitism to the police. At the same time, we have to fight antisemitism through education and through the way we raise our children. As a priority, parents should stop passing on antisemitic messages to their children, and they should no longer neglect objecting to antisemitism. It's a matter of empathy: "Do not do unto others as you would that they should do unto you!" A crash course on empathy was given to Moroccan fathers from Amsterdam-Slotervaart in Auschwitz. They were especially shocked when they learned that Jewish prisoners were forced to take their fellow Jews to the gas chambers. As soon as they let this horrible atrocity sink in, our Moroccan fathers weren't able to sleep for days. They often shared this story with the people in New-West, even during the Gaza-war, when the members of their community were giving them the cold shoulder. Men of the SSOP and others who visited Auschwitz, don't stop sharing this story, share it at schools, at our youth centers, and at the mosques. Talk about this with the women, because I think that our Moroccan mothers should also take a trip like that to Auschwitz an pass on their experience in their children's upbringing. Teacher Mustapha went to the Holocaust Museum in Jerusalem. The goal was to find ways in which he could educate his students about this subject. I receive letters from teachers on a regular basis, who run into indifference or resistance from their students. Teachers should not give in to that. It's part of their job to realize that their students are watching more TV programs via satellite dishes other than the regular news programs. Aside from that, I want to suggest that the Shoah becomes a mandatory subject in school's history exams. Let us, parents and citizens, fight for that. I am very happy that Louis Bouwmeester Elementary School has adopted a memorial monument on Sierplein, around which they organize classes. In facing wrongdoing, such as discrimination we stand courageous; Same way our soldiers and people of the resistance showed courage. Of course they saw the danger and felt the fear. Courage is evident when you overcome those. Thanks to their courage, we are able to celebrate freedom tomorrow. "As a second generation war victim, I was fed up with memorial services, sad family stories, and holiday visits to memorial monuments". And then, his mother died. He had to clean out his parental home. There he found his mother's false identity card. She had to live as though she was someone else. Max's conclusion: "No matter how much I would want it to be, the war is not over yet, not by a long shot". Religious scriptures state that the mourning process lasts for four generations. With our two minutes of silence, we mourn together. A community is like a body - if one limb suffers, all others do. Translated from Dutch to English by yours truly. I hope there aren't any typos, but if you do see any, mea culpa and please do let me know. Thanks. You can also follow Ahmed Marcouch on Twitter and Facebook. Who cares if you don't understand Dutch, he speaks English, so don't hesitate to give him a shout-out! 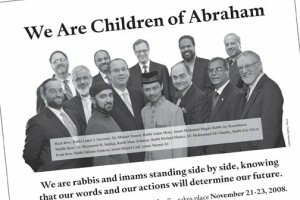 Imams and Rabbis in the US and Canada host their first "Weekend of Twinning" event to raise awareness against "the politics of fear", focus on common grounds between Muslims and Jews and set aside their differences. Jews and Muslims are gathering as part of a national effort to breach the barriers of division. The first "Weekend of Twinning" event was held Friday at Temple Kol Ami with another scheduled for Sunday night at the American Muslim Center in Dearborn. The nationwide effort, sponsored by The Foundation for Ethnic Understanding, the Islamic Society of North America, the World Jewish Congress and the Muslim Public Affairs Council, includes events this weekend at 50 mosques and 50 synagogues in 20 states and Ontario. LOS ANGELES (JTA)—There was nothing unusual about some 20 devout Muslims from the King Fahad Mosque bowing and prostrating themselves as they recited the Isha, or night prayer. Only the site was Temple Emanuel of Beverly Hills, and the worshipers were outnumbered by about 80 Jews watching the unfamiliar ritual. At the same time, in another room of the Reform temple, Jewish congregants were participating in the Ma’ariv evening prayer, watched respectfully by a group of Muslims. Radio Netherlands says not just yet, but the potential is definitely there. The person with the most potential to be "da man" is currently Moroccan-born Ahmed Aboutaleb. Mr. Aboutaleb was recently voted Mayor of Rotterdam by Rotterdam's City Council, making him the first ever Mayor in the Netherlands who is not a Dutch native. The United States has a black president, but the Netherlands has never had a black prime minister. And plenty of other countries have had women heads of government - so why not the Netherlands? The explanation is simple, says Radio Netherlands Worldwide's political editor Hans Andringa. It's simply a matter of time. "New Dutch" people have only been in the Netherlands for a matter of decades, and they have been active in politics for an even shorter time. "Before you get to the top in a political party, so you're as widely recognised and acknowledged as you need to be to become a party leader, it takes a long time." It has taken years for the number of MPs with ethnic minority backgrounds to build up to the present level, yet the figure is still no higher than eight percent of the total. There are even fewer people from ethnic minorities in leading political positions. One exception is the Moroccan-born Achmed Aboutaleb. Currently the deputy social affairs minister, he has just been appointed mayor of Rotterdam. This has a particular resonance, because in recent years the city has been associated with tensions between white Dutch people and ethnic minorities, and was the home ground of the murdered rightwing populist politician Pim Fortuyn. Political commentators have pointed out that if Rotterdam had an elected mayor, it seems unlikely that Mr Aboutaleb would have made it to the post. Fifty years ago, the people of Morocco's Rif mountains rebelled against the central government. The uprising was brutally put down by the Moroccan army and many of the Rif mountains' native Berbers left for Europe. The world's media didn't pay much attention to the 1958 rebellion, but it left its mark on many people's lives, including that of Mohamed Amezian, son of the rebel leader. Barack Obama's victory is also being greeted with enthusiasm in Japan - especially in the city of Obama. The residents of the city, which is in the south near Kyoto, support the Democratic candidate mainly because of the shared name, but they have political reasons too. Last Sunday I got a phone call from my nephew Chakib who lives in Amsterdam along with the rest of my family. He told me to hold on a minute because he had a surprise for me. So I waited for a few seconds and oh what great surprise! Saida? OMG I can't believe it! Saida and I share so many memories, getting in trouble together and having such a great time growing up together. Eventually we went our seperate ways when we were about 19 years old and only seeing each other in passing occasionally. 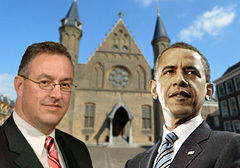 Hey, Ahmed Aboutaleb is now Mayor of Rotterdam hahaaa! I said: Yes, I read about that in the news. Isn't it awesome? She said: Remember when you had a fight with him? Hmm me a fight with Aboutaleb? What are you talking about? Saida: Hahaa well, maybe not a fight, more like an argument. I said: I used to run into him here and there, we knew some of the same people and I do remember having a few exchanges with him, but an argument? Saida goes: Well, maybe not an argument, but more like a discussion about politics and I remember clearly when you said you thought he was an arrogant prick and very stubborn...hahaaaa! Oh WOW really? I swear I don't remember that, but let me tell you something. I've been following his political career in the news for many years now and I'm so proud of him for all that he has accomplished in such a short period of time, despite all the apposition he had to face not just in Dutch society but within the Moroccan community as well. Saida then quickly changed the subject. 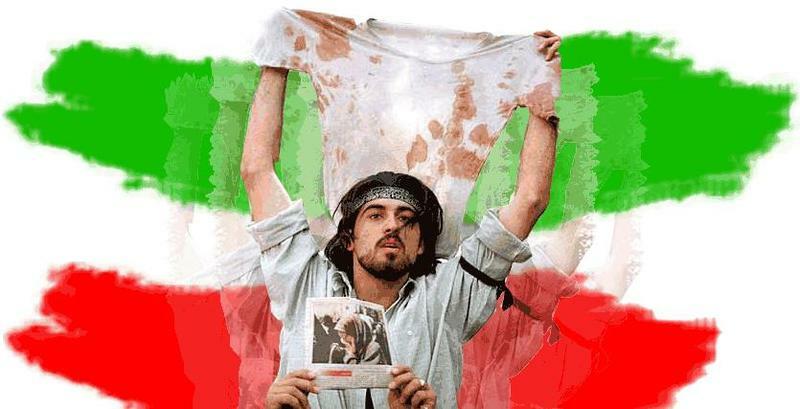 It's about time those nasty mullahs in Iran start acting more civilized. A judiciary spokesman said four people sentenced to die by stoning had had their sentences commuted and that all other cases had been put under review. Iranian student activist Ahmed Batebi has escaped to the United States!